Manthei Meals | Making the most of our family meals at home and out…. Making the most of our family meals at home and out…. Aboard the ship, the captain and crew showed all the guests the same wonderful treatment. They apologized for the delay and promised extra time out on the water! The crew chatted with all the guests making everyone feel welcome! Water and sodas were complimentary, while beer and wine were $5 each. It was the perfect day for a cruise. 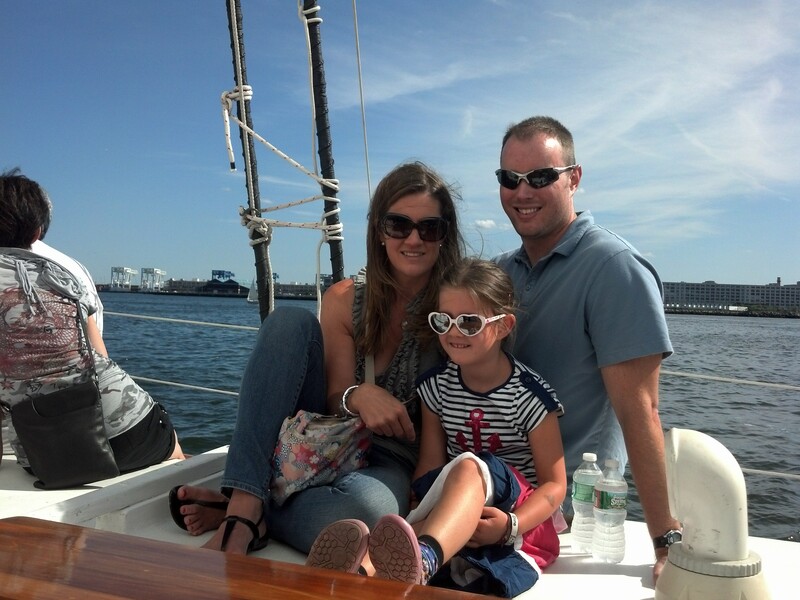 The wind was blowing in the perfect direction, so we were able to head out to the harbor islands! 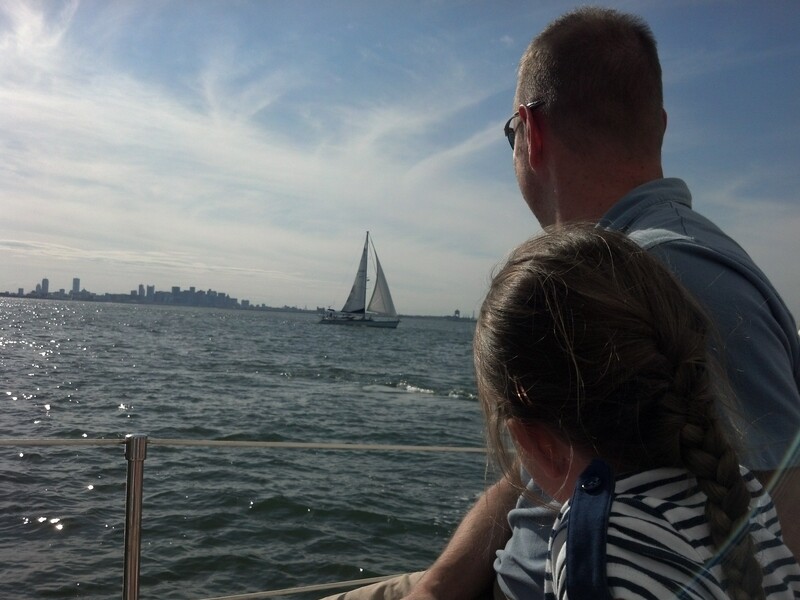 It was amazing to see all the sights of Boston from the water. We can’t wait to bring friends and family back with us! I’m counting down the days, hours, minutes, and seconds until the last bell rings before summer vacation! I’m ready to forget about the dreaded Sunday meal planning. I’m ready to eat late, drink often, and indulge in fresh produce from the local farms. I’m collecting new recipes to make this summer: appetizers, smoked meats, homemade pies, etc…. My daughter and I have also started a “Sand Bucket” List for all of our summer activities. 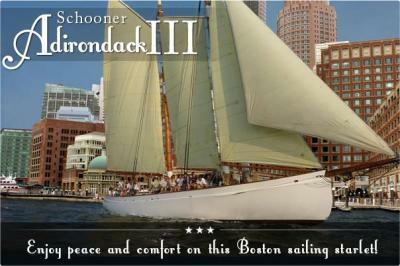 Among many others we are excited to visit Plimouth Plantation, G-pa’s ship (the USS Constitution), and the MFA. 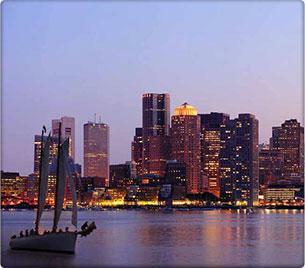 We are also dying to check out one of the cruises on Boston Harbor–a sunset dinner cruise? a whale watch? or maybe that speed boat tour? Whatever we end up doing I’m sure Vitamin D will be involved. Make your own pizza night! The school year is coming to a close and the meals have become less and less exciting. With posts far and fewer between. It’s hard to keep up with a full-time job, being a mom, a wife, and a friend! Who knew at 32 years old I’d have 4 full-time jobs and only getting paid for 1! Well tonight’s MYOP has turned into MMOP (mom makes our pizza). My husband is on his way home from work and my daughter is too tired to make hers! So they get pre-baked pizza crust, leftover pasta sauce, cheese, and turkey pepperoni! I on the other hand am having Chicken Sausage, Fennel, and Gouda pizza. The sweet onion and caramelized fennel was the perfect complement to the salty chicken sausage! As a teacher, the last few days of summer are coming to an end. And unlike many parents who can barely contain their excitement that their children will be back in school for 6 hours a day (remember the Staples commercial with the parent dancing in the aisles?!? ), I am still not ready for summer to be over. I had the pleasure of not working this summer but spending care-free days with my daughter. It may seem like a lot of time, but in essence we are running around like mad men the moment my daughter wakes up. She is the pokiest eater, so I am trying to figure out what can be quickly made and eaten (and even brought in the car if need be). I would prefer breakfast items that don’t get stuck in her hair–e.g. yogurt or syrup! So that doesn’t leave us with too many choices. We have had some all out throw down screaming and kicking battles this summer trying to brush her hair!! Instead of giving in and not brushing her hair, I need some breakfast items that won’t make for a terrible beginning!! On the off chance we do give her yogurt or syrup, I want to try the Knot Genie. I’m hopeful one of these little guys could eliminate the kicking screaming and tears (not to mention knots) that come with a good Monday morning hair brushing!! Are you ready to join the thousands and thousands of mamas who no longer dread the hair brushing drama? Then The Knot Genie Detangling Brush is for you! The Knot Genie and Teeny Genie were created to not only to make brushing of even the most unruly hair effortless, but to create peace in households around the world at bath time. Their unique bristles act like little “fingers” gently untangling knots and tangles. The amazing Knot Genie magically gets rid of knots. Not to mention complaining. The US Family Guide is offering a coupon for $4 off a Knot Genie. With the introduction of four new Knot Genie colors in our limited edition Back to School Collection, we’re also running a fun contest. The contest is called, the Knot Genie Back to School Morning Meltdown contest. If you’re a parent, you’ve probably experienced a foot stomping-shrieking-morning meltdown at that critical time when you’re trying to get your child off to school. Recount (if it’s not to painful) your worst meltdown and how you diffused the situation and enter your story in our contest. Ask your friends and family to vote for your entry and you could win $500.00. The first 50 people to enter will get great prizes just for participating. Just click on this link to enter. Good luck to all the moms who have children with sticky knotted hair on the first day of school! This past week my daughter and I scooted on down to NJ to visit my parents. When I’m with my parents we eat too much, drink too much, and my kid NEVER sleeps enough!! 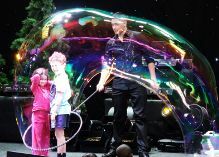 By far my daughter’s favorite activity was going to the Gazillion Bubble Show in New York City at the New World Stages. Deni Yang was the bubble artist at our show. He was phenomenal–totally animated and it was quite obvious that he loves with what he does! My daughter will tell you her favorite trick was when Deni ate a fog filled bubble, burped, and let the fog back out of his mouth! It was nonstop laughs the whole time! Deni even turned the stage into a winter wonderland with all the bubbles! It was crazy! Right now US Family Guide is offering a great deal, $38 tickets!! The tickets usually go for upwards of 44, 64, or 90 dollars! This show is absolutely amazing and a must see! To access the coupon for this great show click on the following link: Gazillion Bubble Show Coupon. PERFORMANCE SCHEDULE: Wed 11am & 2pm, Sat at 11am, 2pm, & 4:30pm; Sun at 12 & 3pm. For Birthday Parties and groups of 12 and more call us or visit our website. After an amazing show we had to end our trip to NYC with an equally amazing brunch! We hiked over to Bobby Flay’s Bar Americain on 52nd Street. We made a reservation but fortunately the hostesses were kind enough to seat us well in advance of our time (1 hour!!). I enjoyed the Pickle Mary-a bloody mary spiked with tomatillo hot sauce and a pickle garnish. The glass tasted like it had been rimmed with celery salt! Needless to say I polished 2 off pretty quickly. We started with the Hot (freshly made) Potato Chips with Blue Cheese sauce. I am seriously addicted to potato chips!! For my meal I had the Mahi Mahi Tacos. The fish was grilled perfectly with just a hint of char. It was served with a Napa cabbage slaw (bright and refreshing), and a trio of salsas. The restaurant wasn’t the best choice for bringing a hungry 4 year old with minimal patience but I would definitely go back with a bunch of my girlfriends!! What do you get when your 4 year old is overtired from a weekend of fun and doesn’t get enough sleep the night before. A mommy who is ready to pull all of her hair out and in need of a (strong) cocktail. My husband just got home from work and commented that our daughter sounded like a newborn! On to the good stuff….literally! I made the Cilantro-Jalapeno Limeade from Cooking Light. It is absolutely delicious. I doubled this recipe to make a full pitcher, so I cheated and used bottled Key Lime Juice. I don’t have an electric juicer and I was not about to juice 20+ limes for a cocktail!! I also only used 3 Jalapenos instead of 4 (for the double recipe). I could taste the Jalapeno flavor but it was not enough heat. So next time (and yes there most certainly will be) I will use the recommended amount of Jalapenos. To turn this delightful ‘mocktail’ into a cocktail, I added a 3-count of Hornitos Tequila to each glass. I also rimmed the glass with Williams-Sonoma’s Chili Margarita Salt. Perfect!! Time for round 2!! Homemade Ice Cream a 4 year old can make! Earlier this week I came across a recipe for banana chocolate chip ice cream. It sounded too easy and delicious to be true! So of course I had to try it. While I had a few hours to myself today while my daughter was at summer camp, I found myself aimlessly roaming the aisles of Target. (Monday was Bed and Bath, then there was iParty, Kohls, and even the Christmas Tree Store–it’s been a $$$ busy week!) Thanks to my ever so dependable “supah smaht” phone I was able to find all the ingredients at Target. Emma and I spent a quick 10 minutes making the ice cream together this afternoon. It is so easy my 4 year old was able to put it all together. She chopped the bananas and chocolate and pureed it in the blender. The only substitution we made to the recipe was to use Lindt’s Dark Chocolate Bar with Coconut. I thought the dark chocolate and the coconut would give the ice cream a richer flavor and more depth. Emma ate up her scoop in record time!